From 1991 until 1999, in our Bicycling Magazine West Coast Editorial Office (which was located in Soquel, California), Anthony Alsberg disassembled, weighed, reassembled and recorded the specifications (specs) for road and mountain bicycles we were road testing and reviewing in our pages. 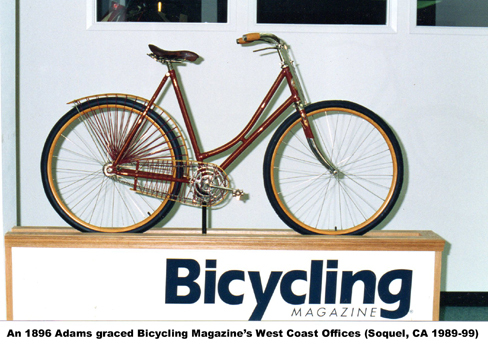 On this page are links to the specifications for all those bikes—some now classic collectibles (like the wood-rim and fender Adams made in Chicago in 1896 shown on the left). Note: Any addresses or phone numbers listed are probably no longer current. Bridgestone MB3 | Boulder Defiant XC | Bridgestone XO 3 | Breezer Storm | Bridgestone MB-5 | Cannondale Delta V 1000 | Cannondale Super V 3000 | Cannondale R-600 | Carbonframes Tetra-Pro | Diamond Back Apex | Diamond Back Dual Response | Diamond Back Overdrive | Dean Easton | Fat Chance Buck Shaver | Foes Fab | Fisher Montare | Fuji Suncrest SX | Giant Cadex CFR-3 | GT Tequesta | GT BTS-2 | GT RTS-3 | Iron Horse FS Works | Iron Horse MT 400R | Jamis Paragon | Jamis Quest | Klein Fervor | Kona Lava Dome | Merlin Exralight | Mongoose Amplifier | Monolith | Marin Pine FRS | Mountain Cycle San Andreas Team | Nishiki Pinnacle | Nishiki FS 3 | Parkpre Comp Limited | Pro Flex 854 | Raleigh MT 400 | Raleigh MT 400 | Rocky Mountain Equipe | Scott Unitrack ST | Specialized Stumpjumper FSR | Specialized Epic | Specialized S-Works FSR | Specialized Allez | Specialized Rockhopper Comp FS | Specialized FSR | Trek 9000 | Trek 7000 | Trek 930 | Trek Carbon 3200 | Univega ShockBlok 10.5Ti | Univega Alpina S7-5 | Wilderness Trail Bikes Phoenix | Yeti A.R.C.